with the Yankees and was a fighter pilot in WWII and the Korean War. "He's just a Hall of Fame guy," Giants broadcaster Duane Kuiper said. SAN DIEGO -- Hall of Fame broadcaster Jerry Coleman, a former second baseman for the New York Yankees who interrupted his pro career to fly as a Marine Corps pilot in World War II and Korea, died Sunday, the San Diego Padres said. He was 89. Coleman spent more than four decades with the Padres as a broadcaster. He managed the team in 1980. Padres president Mike Dee said Coleman died at a hospital Sunday afternoon. He said the team was notified by Coleman's wife, Maggie. A family friend told The Associated Press on Sunday night that Coleman had surgery before Christmas for bleeding in the brain. Doctors discovered more bleeding last week and Coleman had more surgery, said the friend, who spoke on condition of anonymity due to the sensitive nature of the situation. "It's a sad day," Padres manager Bud Black said. "We're losing a San Diego icon. He's going to be missed." The Padres planned to keep Coleman's statue at Petco Park open until 11:30 p.m. Sunday so fans could pay tribute. While recounting his military career in an interview days before the statue was unveiled in September 2012, Coleman said: "Your country is bigger than baseball." Coleman spent some seven decades in pro baseball, a career that included four World Series titles with the Yankees and was interrupted by his service in World War II and the Korean War. He flew 120 missions combined in the two wars. Coleman was awarded two Distinguished Flying Crosses, 13 Air Medals and three Navy Citations. Around Petco Park and on Padres radio broadcasts, Coleman was known as "The Colonel," having retired from the Marines with the rank of lieutenant colonel. He was the only major leaguer to see combat in two wars. "He was a wonderful human being and a great guy," Black said. "He was one of a kind. He sort of blazed his own path from San Francisco and ended up as a war hero and a major league ballplayer and doing so many things in our game. As much as he's remembered for all he accomplished as a baseball man, he was more proud of his military service." Coleman's broadcast schedule had been reduced to home day games. He also did a pregame interview with Black, who said Coleman was self-deprecating and preferred to talk about the Padres rather than anything he'd done with the Yankees or in the Marines. "You wouldn't know it walking down the street that he was a World Series champion and also a guy that flew fighter planes," Black said. Coleman was known for calls of "Oh, Doctor!" and "You can hang a star on that!" after big plays. He received the Ford C. Frick Award from the National Baseball Hall of Fame in 2005. He also was known for malaprops, like the time he was describing Dave Winfield going back for a long fly ball. "I said, 'Winfield hit his head against the wall and it's rolling toward the infield.' I meant the ball, of course," Coleman said in 2012. In a statement, commissioner Bud Selig said Coleman "was a hero and a role model to myself and countless others in the game of baseball. ... But above all, Jerry's decorated service to our country in both World War II and Korea made him an integral part of the Greatest Generation. He was a true friend whose counsel I valued greatly." After graduating from high school in 1942, Coleman traveled three days by train from San Francisco to Wellsville, N.Y., to report to the New York Yankees' Class D affiliate. Still 17, he was too young to enlist and fight in World War II, so he got to spend the summer playing ball. After he joined the military, he flew Douglas SBD Dauntless dive bombers in the Pacific in World War II. He played three more seasons of minor league ball before making his big league debut with the Yankees on April 20, 1949. He was The Associated Press' Rookie of the Year that season. Coleman's best season was 1950, when he was an All-Star and was named MVP of the Yankees' four-game sweep of the Philadelphia Phillies in the World Series. Among his teammates were Joe DiMaggio, Yogi Berra, Phil Rizzuto and Johnny Mize. "We won the first game 1-0 and I drove in that run," Coleman recalled in 2012. "We won the second game 2-1. I scored one of the two runs and DiMaggio hit a home run in the 10th to win it. In the third game I drove in the winning run in the last inning, and in the fourth game I rested." By "rested," he means he went 0 for 3. "I was exhausted," he said. In October 1951, Coleman found out that Marine pilots from World War II were not discharged, but on inactive status and that he'd be going to Korea for 18 months. He missed the bulk of two seasons. Coleman said he took his physical along with Ted Williams in Jacksonville in 1952. Williams, a San Diego native, also was a Marine pilot in World War II, but didn't see combat duty. He did fly combat missions in Korea. When Coleman returned to the Yankees, he hit only .217. He was sent to an eye doctor, who told him he'd lost his depth perception. "If you're trying to hit a baseball and you don't have depth perception, you have a problem," Coleman said. He got that corrected but then broke his collarbone in April 1955. The night he came back from that injury, he got beaned. His last season was 1957, when he hit .364 in a seven-game World Series loss to the Milwaukee Braves. Coleman worked in the Yankees' front office before beginning a broadcasting career that eventually brought him to San Diego. "First and foremost, he was an American hero whose service to this country is his lasting legacy. He was also a great Yankee, a true ambassador for baseball, and someone whose imprint on our game will be felt for generations," Yankees managing general partner Hal Steinbrenner said. "On behalf of the entire New York Yankees organization, we send our deepest condolences to the Coleman family." Coleman managed the Padres in 1980, when they went 73-89 and finished last in the NL West. Coleman was fired and returned to the booth. "I should never have taken it," he said. "I look at it now and see the mistakes I made. If I wanted to be a manager, I should have gone to the minor leagues and developed there." Coleman's statue at Petco Park depicts him in a flight suit. Coleman said the closest he came to being killed was in Korea when the engine in his Corsair quit during takeoff and his plane flipped. He preferred to talk about his comrades. Coleman remembered a mission over Korea when a plane piloted by his buddy, Max Harper, blew up and flew straight into the ground. "I knew there was no need for help. It was an unpleasant thing," Coleman said. In describing the two-seat Dauntless he flew in the Solomon Islands and the Philippines, Coleman said the gunner "was the bravest man I knew. If I did something wrong, he died, too." Longtime San Francisco Giants broadcaster Duane Kuiper mentioned the various halls of fame Coleman belonged to and added: "More than anything he's just a Hall of Fame guy. If he had a bad day, it was never around us. He was always in a good mood. He was quite funny. Northern California guy. Really just a great guy. I'm shocked and saddened that he passed away. "Here's a guy, what didn't he do in life?" Kuiper said. With Joe D. Last game before recall to active duty as a pilot in the Korean War. I started watching and following baseball and the Yankees in 1966 - by 1967 I was full into it. The WPIX and radio (I think it was WMCA at the time) announcers thru the later part of the 60's were were Coleman, Scooter, and Joe Garigiola - I think Frank Messer came in toward the end of the decade. They all did a great job. Coleman's malaprops, combined with the Scooters eccentricities, and Garigola's wit made for a terrific broadcast. He will always be a part of my youth however brief his stint with WPIX was, and I will always remember him fondly for that. Good lord, we are losing a lot of my heros lately. In an interview years ago, Jerry Coleman was asked what his most memorable time in baseball was. He said it was Oct 2, 1949. The Red Sox had come into Yankee Stadium for the last two games, needing a split to go to the World Series. I found an article written in 2005 at Coleman's HOF induction. 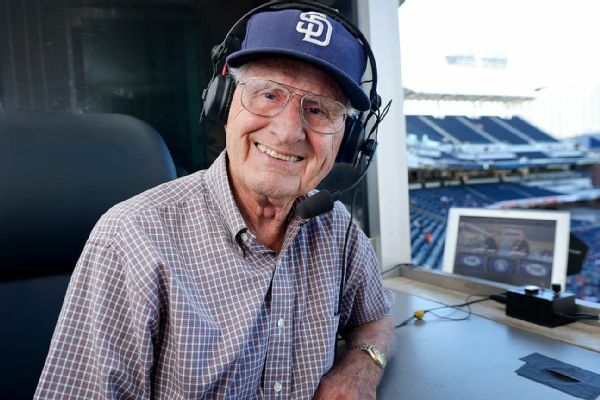 Jerry Coleman will be in Cooperstown, N.Y., on Sunday because of his work as a broadcaster. But he was mingling with Hall of Famers long before he stepped behind a microphone. His broadcasting career has stretched into five decades, chronologically dwarfing his nine-season major-league playing career. Yet, in those nine seasons, Coleman already had ensured his place in baseball lore. He was part of six world championships in his nine seasons with the New York Yankees, and he was not just along for the ride. He was named American League rookie of the year by The Associated Press in 1949 and earned World Series MVP honors the following season. He had a pennant-clinching hit against the Boston Red Sox in '49. If he played in today's less-genteel environment, he very well might be known as Jerry "Bleeping" Coleman throughout New England, a la Bucky Dent or Aaron Boone. Coleman's playing days extend beyond such accomplishments or mere numbers: 723 games, .263 batting average, 16 home runs, 217 RBIs. Coleman played in a very special time and place. He was front and center to the glory days of New York baseball. He saw the transition of the Yankees empire from Joe DiMaggio to Mickey Mantle. He played against the Giants' Willie Mays, and the Dodgers' Duke Snider and Jackie Robinson. His final season, 1957, was the last year New York had three big-league teams. "I've had three homes," Coleman said, "my years with the Yankees, more than 30 years with the Padres and five years with the Marines. You never forget a home." Though Coleman regards himself as blessed to have his Yankees experience, he said it really had little impact on his broadcasting career. "It gave you a background, but it's none, really," Coleman said. "It's two different animals." Those who have listened for Coleman for any length of time know he's a stickler for fundamentals, particularly at his position of second base. It was the Yankees way, drilled into Coleman by coach Frank Crosetti: Use two hands, always choose the soundness over style. "If you see a mistake, as a broadcaster, your job is to point it out and explain what the mistake was," Coleman said. "But don't dwell on it. Mention it and move on. It bothers me seeing announcers who are in the seventh inning saying, 'Well, if so-and-so had made that play in the second …' "
When Coleman kvetches about the modern ballplayer getting sloppy with fundamentals —— the one-handed catch is a particular annoyance —— he isn't being old-fashioned or stubborn. He is speaking from experience and success. His contemporaries say Coleman is among the finest defenders to play second base. "I've seen some second basemen that might be equal," said Bobby Brown, Coleman's teammate in New York, "but I've never seen anyone better than Jerry. "I've never seen anyone better at turning the double play. He and (Phil) Rizzuto were the best double-play combination —— as good as any I've ever seen." The remarkable thing is that Coleman played on the left side on the infield until spring training of '49. Coleman wasn't going to unseat Rizzuto at shortstop, so Yankees manager Casey Stengel gave him a look at second. In his classic book "Summer of '49" that chronicles a great pennant race between the Yankees and Red Sox, author David Halberstam portrayed Coleman as a nervous rookie who was uncertain about the new position and developed ulcers as he attempted to live up to the expectations that came with being a Yankee. Popping antacids all season, Coleman delivered exactly what was expected of a middle infielder in that era: sharp defense. His bat was steady enough, too. He batted .275 and was second on the team with 123 hits. The last of those hits was the biggest of all. A fierce pennant race came down to the last game of the season at Yankee Stadium: Red Sox vs. Yankees. Boston entered the final series, a two-game set, with a one-game lead, then dropped the opener to set up the winner-take-all finale. The Yankees were nursing a 2-0 lead when Coleman came to the plate with two outs in the bottom of the eighth inning. The bases were loaded after hard-throwing pitcher Tex Hughson walked Cliff Mapes intentionally to get to Coleman. Hughson tried to overpower the rookie, and he almost succeeded. Coleman fought off a high, inside fastball and managed only a short pop-up into right field. Coleman found the perfect spot, however, as the ball spun away from second baseman Bobby Doerr and fell in front of right fielder Al Zarilla. It became a bases-clearing double that extended the Yankees' lead to 5-0. Since the Red Sox scored three times in the top of the ninth, Coleman's blooper essentially was the pennant-winner. "It was the worst thing that had ever happened," Red Sox star Ted Williams told Halberstam decades later. "That cheap hit. Forty years later, I can close my eyes and still see it, still see Zeke diving for it and the ball squirting to the line." Coleman collected another 435 hits in his career, plus 19 in the World Series. In 1950, he went 5-for-20 with three doubles and four RBIs in a four-game sweep of the Philadelphia Phillies to earn World Series MVP honors. But his days as a Yankees full-time starter lasted only three seasons. In 1952, he was recalled to military service and missed most of the next two seasons while flying combat missions in Korea. With Billy Martin on the Yankees scene, Coleman never again exceeded 300 at-bats. He took a front office job after the '57 season —— the Yankees told him they would trade him otherwise —— and moved into the broadcast booth in 1960. The rest is fodder for his Hall of Fame biography. "I've got no regrets about going back (into the military)," Coleman said. "The Marines are where I grew up."